Will you help them? Or, will you forsake them? 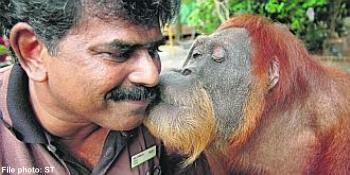 Born in 1960, Ah Meng was a female Sumatran orangutan who was a famous tourism icon of Singapore. She was smuggled from Indonesia and kept illegally as a pet until she was discovered by a veterinarian in 1971. After being recovered, Ah Meng was brought to the Singapore Zoo where she quickly rose to fame as the star of the Singapore Zoo’s ‘Breakfast with an Orang Utan’ scheme. In March 1992, Ah Meng received the Special Tourism Ambassador award from the Singapore Tourism Board. She passed away on 8 February 2008 due to old age. In her lifetime, Ah Meng was immensely well-loved not only in Singapore, but also by many other popular public figures and celebrities such as Michael Jackson. Like many other Singaporeans, Ah Meng had a special place in my heart. As a child, I grew up pestering my parents to bring me to the zoo for the sole purpose of visiting her. She was not just an orangutan to me; she had a motherly air around her that made her especially charming. To me, the name Ah Meng was and remains to this day synonymous to the Singapore Zoo. Importantly, she has played an important role in increasing awareness of how every individual has a role in anti-poaching, anti-deforestation and conservation issues. Thus, when the opportunity presented itself, I thought that it would only be appropriate that I would dedicate it to the late Ah Meng by writing on the issue of orangutan conservation. This is for you, Ah Meng. You are dearly missed.